Recession Affects Millions – But There Is A Cure! Gum disease affects millions of people around the work. And, gum recession ( the loss of gum tissue and supporting bone around a natural tooth) makes up a big part of the problem. Unfortunately, loss of gum and bone can eventually lead to tooth loss. But there is a cure! Dentists and periodontists (dentists who specialize in the treatment of gum disease) can repair the damage caused by gum recession. With a traditional treatment approach, a small amount of gum can be removed from another part of the mouth and used to repair the tooth that has lost gum. 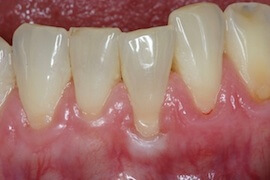 The exposed root can oftentimes be covered to improve the cosmetic appearance of the tooth. This is generally considered to be the “gold standard” of treatment because the patient’s own gum is used. The downside is that the area that the gum is borrowed from (it grows back) can be sore during the healing phase after treatment. Over the years, various materials have been developed to be used as a substitute for using the patient’s own gum as the donor. These include donor grafts from cadavers……Yes, it sounds unappealing, but it is perfectly acceptable and has been used for decades. Newer materials are now available that are made from collagen (the building block of all skin)! The general benefits include avoiding a second surgical site to borrow the gum, so there is less soreness. And the results appear to be quite promising. We, at Periodontal Associates, have been using Mucograft collagen matrix for awhile now with much success in treating gum recession (and, no, we do not have any affiliation with the company). Our patients are very happy with the outcomes which include improved cosmetic appearance, improved gum health, and their improved quality of life.